Powerful, flexible, and extensible. Stacks turns RapidWeaver into a professional-grade web development tool. With a community of developers and hundreds of pre-made stacks, you can build anything. Requires RapidWeaver 6 and macOS 10.9 or newer. Build modern, responsive web pages with simple drag and drop. Add columns, images, and content with ease. No coding required. There are now more than 800 stacks available. Whether you need animations, icons, image galleries, or social buttons, there's a stack for that. Partials let you build pages from reusable components that you create and share across your whole website. Partials take the repetition out of web design so you can focus on building better sites. The new Stacks 3 library is completely redesigned and faster than ever. Scroll through hundreds of stacks at blazing speed and search instantly. Like everything in one window? Or floating windows for libraries and settings? A little of both? We've got you covered. Stacks lets you work the way you want to. Use the Stacks API to extend Stacks and make it do just about anything. Or publish your creation and share it with the world on the RealMac community site. The Stacks API is fully documented. 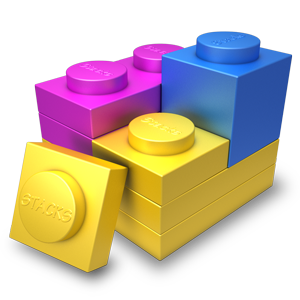 Stacks 3 requires RapidWeaver 6 and macOS 10.9 or newer.